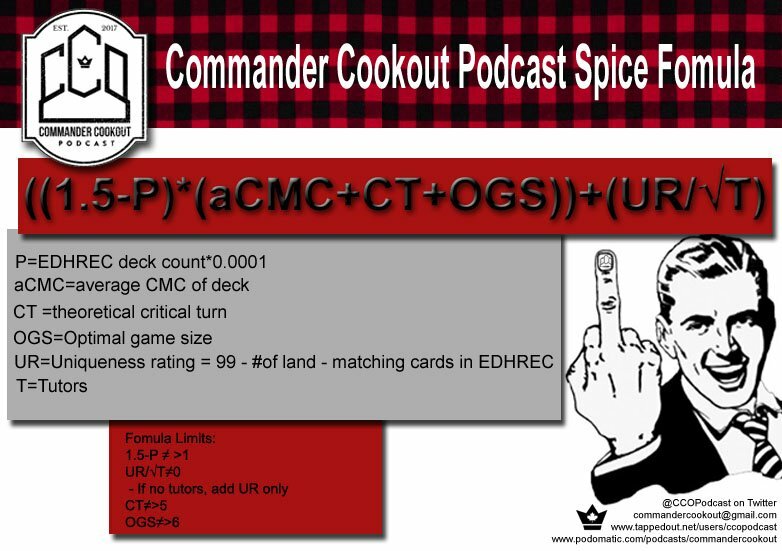 Welcome to Commander Cookout Podcast, or CCOPodcast as we like to call it! Here you'll find an all-Canadian, home-brewed, Magic: the Gathering podcast. We're based on unique, spicy and funny Commander deck building. Come join #CCONation! We do all kinds interesting and unique takes on decks, analytics and we have many ways to be fun and entertaining. In CCONation, all are welcome and equal. For this reason, none of our content is ever hidden behind paywalls. Also, all of our giveaways are open to everyone for no monetary investment or pledging. Tune into the show for more details on how to get yourself entered! On CCOPodcast, you'll hear us talk about building spicy Commander brews, how to spice up boring lists and drinking beer. If that's the kind of Magic the Gathering podcast that sounds appealing to you, look no further that CCOPodcast! We are Ryan and Brando from the beautiful city of Saskatoon, Saskatchewan, Canada. We know, it's a mouthful. You don't actually have to remember that part. Or be able to pronounce it! Collectively, we have somewhere around 44 years of Magic the Gathering playing experience! Now, we play commander almost exclusively. That is, if you don't count the MtG drinking games we make up along the way. We started CCOPodcast for a few reasons. First and foremost, because we both love Magic the Gathering. It's entrenched itself in our lives. It's become part of who we are and created some of the strongest bonds that people can have in their lives. It would be hard to imagine life without Magic, really, wouldn't it? Second, Brando works in radio and while he isn't currently a radio personality, that's one of his career goals. The podcast acts as an avenue towards that goal. It certainly didn't hurt to have a radio station's recording equipment at our disposal! Astoundingly to us, we now have, what we call, a world wide Audience! As mentioned before, that audience has come to be known and #CCONation. The majority of our listenership resides in the USA and Canada but the top 10 countries in #CCONation after that are Brazil, The United Kingdon, Australia, Philippines, Germany, Belgium, Italy, The Netherlands, Mexico and France! Holy crap, that's awesome! Shout out to all you guys and every other nation that tunes in every week! A couple things actually. For one, we're normal dudes. Dudes that you might want to actually hang out with. We talk about beer, hipsters and usurping all other casts on Podomatic.com! We do Arcs of episodes. Like mini-seasons. A few episodes in a row on a common topic to get as much coverage as we can. Along with each new Arc comes a giveaway! You can enter for free too! Usually that involves a re-tweet or a share somewhere. Also, with the help of EDHREC.com, we've come up with both the Milk List and the Spice Calculator. The former is a list of every color combination in Magic. For each combination, we look at the most popular cards at each mana cost as per EDHREC. The less cards we play on the list, the more unique the deck. It's good simple fun. That's how we use science to figure out JUST how spicy our lists are. This is where you can take your first step towards OFFICIALLY becoming a member of #CCONation! - The current Arc's sign up gift. This could be a themed altered art card, a signed card by Ryan and Brando, a sticker or some other form of CCO memorabilia. - ***NEW*** Patron only Discord access! - Free shipping on all altered art auctions won on Facebook! - CCO Pre-Show access on Monday prior to the podcast's regular Tuesday Launch. - A personalized thank you. This is where you can truly, and whole hearetedly, become a member of #CCONation! For that, we are also very greatful! - Same as previous tier. - Shout out on the podcast and your CCONickname! Muhahahaha! Ok, let's call a spade a spade, it's people like you that let us keep bringing the CCO spice to your ear holes. - Same as previous tiers. - Decklists sent in will be considered preferred list for Arcs that we use listener submitted decks. - When required, patrons will be consulted via email/private message to help put together ideas for shows/Arcs to help us out. - Creative Consulting Team access. We send out emails/private messages looking for assistance putting Arcs and other content together. Help us steer the show! - When available, raw/uncut/blooper reels will be available before the final product is available to everyone else. Join or upgrade now, space is limited to just a few patrons. Have a business, channel or product you'd like us to talk about on CCO Podcast? Get in touch, we'll work something out. - Time slots to promote your product can be set up on the show and/or as part of Arc sponsorship. - Links to your page/content/product will be in every episode's shownotes. - Other benefits can be set up on a case by case basis. - Your product/content discussed on show/in show notes first. - Links and product placement on our Facebook page. - An additional time slot at the completion of each episode. - An additional time slot in our Arc completion episode.